Internally, we talk about Acceptable Ads all the time. Ever since we decided to take the middle way, choosing not to block all the things but instead support publishers by creating “Acceptable Ads,” there’s been a simmering cauldron of discussion in our office – as well as engaging conversations with advertisers, publishers, and our open source community – about whether allowing non-intrusive ads is working. Because we discuss it so frequently, we often forget that you don’t. So even if everything we do seems crystal clear to us, we understand that it might be murky to you. Hence this blog post. You can read about how we monetize, and why, the criteria for Acceptable Ads and every whitelisted ad in our open forum. But this post has a simpler aim: explain how our monetization works. While we cannot provide details about specific contracts or partners, we can describe how we monetize. 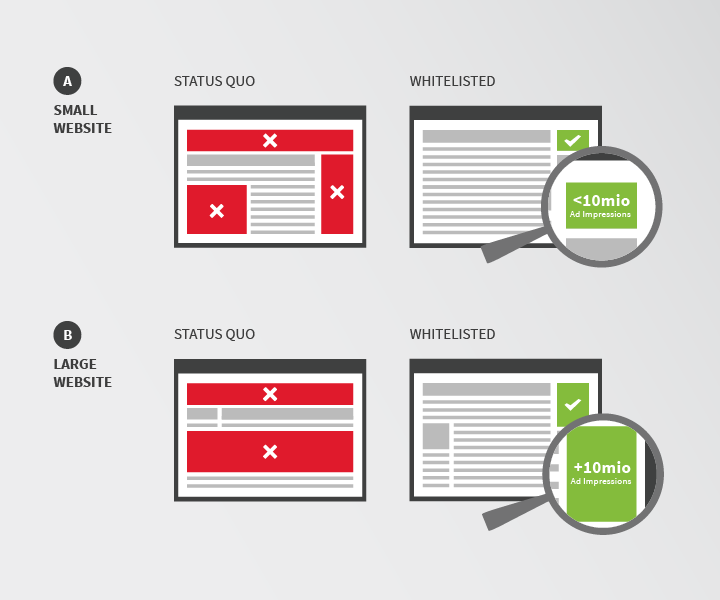 First, it’s mega-important to understand that when websites or advertisers apply to be on the whitelist, the specific ads they want to whitelist must meet the Acceptable Ads criteria. There is no “pay-to-play,” just as there are no exceptions. We invite you to view all our whitelisted partners and discuss specific whitelisted ads in our forum. After applying to be whitelisted and agreeing to meet criteria, a small percentage compensate us while the rest are free – but where do we draw the line between the two? As you can see on this web page, only advertisers that stand to gain more than 10 million incremental ad impressions per month because of whitelisting are asked to sponsor. To put that in perspective, if 5 percent of a site’s users block ads, for example, then that site needs to have 200 million ad impressions to begin with in order to break the 10 million threshold. A site’s non-ad block traffic is not included in the calculation. Using this definition, most publishers don’t pay anything at all – in our last measurement, 90 percent were free actually. This image shows that difference, comparing small site “A,” which would be whitelisted for free, to big site “B,” which would provide compensation. The second part is calculating the fee. For those not admitted for free, we calculate the licensing fee as a percentage of the extra revenue the advertiser earns after whitelisting. It is not based on total ad revenue, but rather the value our service creates. This revenue allows us to hire employees to do the hard work providing that service demands. Software engineers have to maintain the whitelist, monitor it and provide customer service to each whitelisted site, whether payment is involved or not. Acceptable Ads also provides value to publishers that was previously unavailable – and not only value, but sustainable value created with the user rather than at his/her expense. Plus, it encourages better ads. By financially incentivizing nonintrusive and subtle ads, Acceptable Ads is helping to discover new standards for better ads by running what is, at the end of the day, an experiment in innovation. Right now we’re laying the foundation for a committee to take over Acceptable Ads. Giving over control to independent players from the ad industry, from nonprofits and from tech will hopefully allow the idea to grow while making it more transparent. Finally, this blog post will not answer every question. Trouble is, we can’t, because NDAs and contracts. So while we cannot provide information about specific contracts, we will continue to take every opportunity to explain how our system works and why we think it’s fair. If AdBlock stops blocking ads there will soon be other adblockers. I will use them instead, no problem. Fair enough. There are like 200 ad blockers out there. Dropped Adblock Plus (and I did pay to use it through PayPal) as soon as you decided getting money was more important than doing what I’d paid your software to do; block all advertising except on sites of my choosing. Use the Opt Out feature? Why? Sorry but I’ve lost all trust in you and your software; better to just use one of your competitors that hasn’t “sold out”! Sorry to see you go. We think a balanced approach to ad blocking is better than an absolutist one. Still … you can configure ABP any way you like. In any case, thanks for reading the blog. In contrast to the other solely negative comments, I personally appreciate ABP’s decision to include acceptable ads. I think it provides a good balance between allowing sites to “trample” on my eyes with ads however they want and preventing free services from monetizing via ads at all. ABP is becoming a sort of ad police, promoting tasteful ads that won’t disrupt my browsing experience. I think this is a good thing. Even though I don’t like ads, I would rather use a free service that is supported by a few acceptable ads than have to pay for the same service without ads. Thanks, Ben. This is a great example of what we’re after, ie having users understand why we think Acceptable Ads is better than complete ad blocking and how we are running it. Of course, if people feel differently, we also want them to know they can turn it off. Thanks! Hopefully we’re doing our part to keep you informed of how we operate. It should not be legal to monetize ads in a tool called “Adblock Plus”. The clear expectation from users is that the tool will block ads, not display them in order to make money. A semantic argument, but I getcha. A more appropriate name would indeed be ‘Web Customizer’ or something … but we can’t really rename ourselves after a decade. What we did change with Acceptable Ads is our mission: we want to encourage a middle ground between ad blockers and ads. On another note, why not just turn off Acceptable Ads? Sure, deceptive advertising is generally about semantics. On another note, if I want to use an ad blocker why would I use a program who’s mission is to show ads? Hey again. Our mission isn’t to show ads. Rather, we want to provide users with control over their online experience. We also would like to be a positive force in online ads, and that’s why we encourage Acceptable Ads. We want to give you the product out of the box the way we feel it’s the best, and we think supporting publishers by allowing nonintrusive ads is the best way to run our product. But of course we can’t know if you agree with us — so we let you customize it in infinite ways. Turn Acceptable Ads off, add your own filter lists … whatever — it’s up to you. ublock is more efficient tho anyway. Some of these comments are dreadful and seem to written by egotistical people only thinking about themselves. I really like where you are going with ABP, leading to a better community where ads are kept (to provide income for creators), but kept to a sensible level. I also like how you give free white-listing to any website that will be affected with less than 10,000,000 ad impressions, that’s a really great thing for the community. I do hope you’ll continue the acceptable ads program, it’s one of the only reasons I do use ABP over other ad blocking programs. Thanks for the encouragement, glad you see the value in Acceptable Ads. As for the other comments, I’m actually fine with the criticism … we always need to improve! I’m happy to see a discussion about this that isn’t just a bunch of threats and violence. In practice, I don’t really see that many blocked ads anyway and I haven’t found ad blocking to be much of a problem. While I do earn a living through advertising revenue I can’t say it’s gotten to the point where I’ve experienced any real negative impact. Yeah, agreed. Calm discussions on this topic are what we need. YouTube ain’t working with adblock plus any more please get fixed. Weird. It’s working for me. Please send specifics (browser type and version, ABP version and exact behavior) to support@adblockplus.org. All these comments written by egotistical (webmasters) does not represent ABP users. @uBlockfan1 All Adblockers is compared to Adblock plus because it is the best :) more why tear his shirt? A simple checkbox does the job #c006045 ! Sounds like you have a conflict of interest here and need to decide who your customers are: users or ad companies. Do you really think you can serve both and give them both what they want? We want to create a compromise, but our ultimate service comes first to users. ABPfan, ABP is the best ad-blocker on most platforms where it exists, and until HTTP Switchboard (predecessor to uBlock Origin) was released, ABP was the best ad-blocker on all platforms; however, uBlock Origin is technically better, both running more efficiently than ABP and accepting a wider range of filter inputs (i.e. ad-blocking HOSTS files), and allowing fine-grained domain-by-domain control over certain types of requests, akin to Policeman for Firefox, or uMatrix for Chrome (the other descendant of HTTP Switchboard), somewhere between those two and NoScript in specificity. I hope it doesn’t attain utter dominance in the ad-blocking space, however, because I like how the Acceptable Ads initiative is showing the more acceptable ads to the unwashed masses, and the uBlock Origin developers despise the program (in particular, supporting neither $sitekey nor $document in whitelist rules, on principle). I also don’t think it will attain such dominance, because it is less user-friendly and any significant support for user issues piggybacks off the ABP support community. When I had Internet Explorer 7, I had downloaded your excellent ADBLOCK software, and it worked great! Now, I have Window 10, with Microsoft Edge, and the ads on my Yahoo e-mail are back, and unblock able. When they change to new ads, it interrupt the typing for a second, but it’s extremely frustrating. We need your software to get these ads blocked. How long before you come out with the Microsoft Edge Adblocking software? At this point, if it works, I would be happy to purchase it from your company. Lewis (#19) is correct: as soon as Edge supports extensions, we’ll have one there. Wow. So what about your AMA a while back? You stated that you charge groups to help them meet acceptable ads criteria, but never that that you charge somebody who met the criteria without help. That seems pretty intentional, disingenuous, and worthy of criticism. Sorry about the lag in response. Our monetization happens irrespective of whether people need help meeting the criteria. First they meet the criteria (pay or no) and then we whitelist the ads. After that, around 10 percent pay for the service we provide, just as Lewis pointed out below. Hope that clears things up. For #17, ABP for Edge will be released as soon as Edge supports extensions. For #18, Eyeo doesn’t charge groups to help them meet the criteria, it charges entities expecting to make at least 10 million additional impressions as a result of the whitelisting as a portion of the additional ad revenue as a result of the whitelisting, and it does so to subsidize maintenance of the whitelist for all entities; IIRC it doesn’t help anyone meet the criteria, just checks before whitelisting and monitors and responds to complaints after whitelisting. Thats very god stuff. Is Adblockplus also available in German? Unfortunately, the blog is only in English. I have to say that I like the compromise that adblock plus is trying to obtain between still allowing the financing by advertising, and stopping the intrusive ads. However, I see a significant problem remaining in the “acceptable ads” policy put in place. The primary problem of unacceptable advertising is not only, and not mainly, the “visual pollution”. The hideous part resides more in the privacy and security issues. ALL scriptable ads are potential malware vectors. Only static ads are free of that problem. And all ads that relay to an advertizers’ intermediate site give information about the user visiting a specific page on the web, whether he clicks on that ad or not. As such, an advertizer intermediate can “profile” people by identifying the successive pages he/she visits, as long as there are ads managed by the advertizer intermediate. This is an unacceptable breach of privacy. So as long as ads relay implicit information about the visitor of a page where the ad is present to the advertizer intermediate, this is a privacy leak and hence not acceptable. Thanks for commenting. When we began Acceptable Ads back in late 2011, according to our research, the number one factor for wanting to block ads was annoyance with format. So we decided to focus on that. For Acceptable Ads, for now anyway, it makes more sense to keep criteria focused on an area, ie format, on which it’s possible to bring the most users and advertisers together on. All that being said, we offer privacy protection as an optional feature — just enable the EasyPrivacy feature. Ah, that is good news, but what is its principle ? Because in order for the site owner to be remunerated when someone “sees” the ad, how can this be done without sending the viewer’s IP-address to the advertiser ? To register the two typical types of metrics to measure ads, ie impressions or clicks, the advertiser doesn’t need to know who saw it or clicked it.